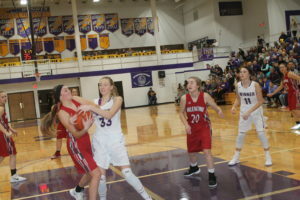 Winner Lady Warriors basketball team had a strong first half as they defeated Bennett County 77-28 on Jan. 16. Morgan Hammerbeck scored 20 points followed by Madyson Frazier with 10, Abby Marts and Ellie Brozik with 9 each and Maggie LaCompte, 8. Marts pulled down 6 rebounds. Frazier had 6 steals and 5 assists. Morgan Hammerbeck scored a season high 35 points to help Winner girls basketball team to a 72-58 victory over Pine Ridge on Jan. 18. Gabby Kocer added 16 points for Winner. Hammerbeck pulled down 15 rebounds.